A Confederacy of Lunches is a site dedicated to the "Dispatches of a Traveling Epicurean". You'll find my travel blog, pictures of places I've been, people I've met, and the delicious food I've eaten. I might also throw in a movie, book, or music review from time to time as well. My Paris Highlights: Where to Eat & Drink. Paris is obviously one of my favorite cities in the entire world. There is so much to see and do. Despite their reputation, Parisians are some of the warmest, helpful, people I have ever encountered. It is no wonder that artists, poets, authors, brigands, scoundrels, lovers, and citizens of the world have found their way to Paris for centuries. It is truly The City of Lights. There are places I found on my recent trip that I wanted to share with everyone because they made my trip so much better, and I want other to enjoy them as much as I did. Chef Stéphane Jego's nose-to-tail restaurant is a small, high-energy place on the Left Bank in between des Invalides and Champ de Mars. Although the restaurant may be small, there are no small portions at L'Ami Jean. Chef Jego uses every part of an animal he brings into the restaurant. He also goes out of his way to make sure that two people who order the same dish experience it in different ways. The menu changes constantly so it's a place to return to often. Save room for the rice pudding. It's his mother's recipe and it is unbelievable! Another recommendation from my friend Wendy Lyn pays off in a huge way! Lucas Baur de Campos and Ninon Leconte have opened a fantastic place that is now among my favorite places to eat anywhere in the world. Lucas and Ninon are from Southern Brazil, and their restaurant uses a real wood fire BBQ to cook delicious meat, chicken, and fish. They then pair these with sauces that harken back to their home, and smaller plates that use local ingredients to create an atmosphere that is more like eating in a close friend's kitchen than a restaurant in Paris. The night I went the menu had some very interesting dishes. I went mostly seafood, but Lucas made sure I got a sampling of everything good on the menu. Ninon was right on time with her recommendations on food as well as their selection of natural wines. Every bite was delicious. The menu changes frequently to reflect what is fresh and in season. Lucas and Ninon are so warm and friendly, you can tell they put their hearts and souls into Brutos. I will make it a point to return every time I'm in town! The oldest covered market in Paris is in the Marais (now you know why I recommend staying there!). It has stall after stall of gorgeous produce, meats & cheeses, seafood, flowers, baked goods, and food stalls that serve everything from vegan food to one of the best sandwiches in the world. The market is worth strolling through even if you aren't in the mood to eat anything. Trust me, you'll find SOMETHING to tempt you! I always like finding places where locals hang out when I travel. 25-50 Wine Latitude is one of those places. Mark the owner has created a place where locals feel comfortable coming in and buying a bottle of something he's found or sitting at the bar itself and drinking glasses of what he opens on a particular day. I went back a couple of times and Mark was happy to discuss French and German wines (he has dual citizenship) as well as American wines (he spent several year here, mainly in N. California). If you look at 25-50s Facebook Page or the Google reviews you'll see that on the night of the terrorist attack at the Bataclan Music Hall (right around the corner from 25-50) Mark kept 25-50 open as a safe place for people to congregate and decompress. So not only does he sell amazing wine, he's a good guy as well. More than enough reason to frequent his place. I've mentioned before I'm no art expert but I know what I like. While I appreciate the classical artists, I'm much more drawn (no pun intended) to the impressionists. 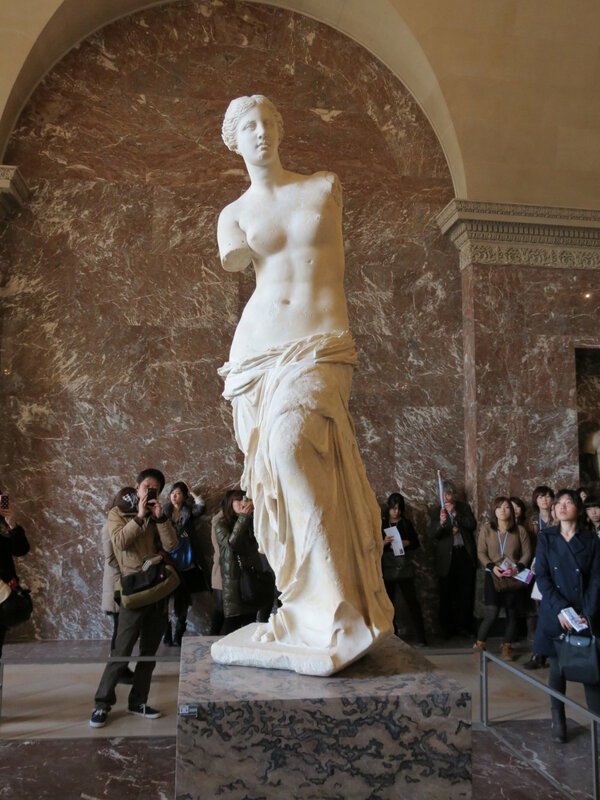 The Louvre is obviously one of the great museums in the world. If you've ever been to Paris, seen a travel show about Paris, or seen a movie about Paris (DaVinci Code anyone? ), you've seen the Louvre and it's now famous Pyramid entrance. Here is my dirty little secret...I'm not a fan of the Louvre. Don't get me wrong, I fully understand the significance of the art in the museum. I am just not a fan of the place. It's way too big. It's ridiculously crowded. You really can't appreciate any of the major works because there are so many people around each one talking, taking selfies, and getting in your way, that the entire experience is just unpleasant. So I approach visiting the Louvre like a military operation. Get in, do what I need to do, and get out. I do notice that the museum has added a new section on art from Asia, Africa, North, and South America. I make a note to check it out. The famous paintings, sculptures and artifacts are everywhere. It truly is a spectacular collection. Again, it's the fact that you are looking directly at something that thousands and thousands of people have looked at and had their own ideas about that is so wonderful. I am pleasantly surprised with the art from beyond Europe. It's fascinating to me that the art is so similar despite the distance between the people who created it. The key to enjoying the Louvre is doing lots of research before you get there, pick out the stuff you want to see, see those things and hit the road. According to the dictionary, Impressionism is defined as, " A style or movement in painting originating in France in the 1860s, characterized by a concern with depicting the visual impression of the moment, especially in terms of the shifting effect of light and color," and, "A literary or artistic style that seeks to capture a feeling or experience rather than to achieve accurate depiction." The impressionists broke away from the convention of what was considered "art" by the Académie des Beaux-Arts in France (who preferred paintings featuring historical or religious themes and figures). They wanted to paint out of doors, where the light changed the way they saw people and places. They wanted to paint landscapes and scenes of everyday life. Of course the Académie lost their collective minds, and the critics railed and mocked the new artists -- among them Claude Monet, Pierre-Auguste Renoir, and Paul Cézanne . After years of being rejected by the Académie and banding together to show and promote their new style of art, the public began to realize that this new style was actually a legitimate form of art and embraced what the impressionists were doing. Impression, soleill levant by Claude Monet. The painting that gave the movement its name. Of course, today we look at these artists as masters and their works as masterpieces (to me even more so than the 'traditionalists" like David). I mean come on. 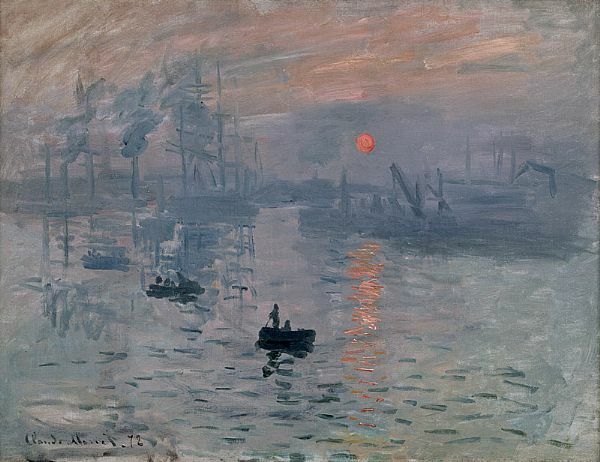 Would you rather spend you time looking at paintings of some rich dude who could afford to have a famous artist paint his portrait or Monet's Impression, soleil levant? There is only one answer really. The Musée d'Orsay, opened in 1986, houses the largest collection of impressionist and post-impressionist art in the world. I fell in love with this place when I was here in 2006 and if anything, my love has only gotten stronger. Unlike the Louvre, the d'Orsay is easily navigated. I could spend hours going from room to room. I'm fascinated by the impressionists and their work. The use of light, the individual brushstrokes, showing people living life. It speaks to me in a very deep, personal way. The truth is if you're going to Paris you need to have a French Bistro experience. You need to go to a place that is busy, full of energy, noisy (but not loud), and serves outstanding, classic, rustic food. There is no better bistro experience in Paris than Bertrand Auboyneau's Bistro Paul Bert. The menus are handwritten on chalkboards in French of course, and with a little help from my awesome server (he literally had half the restaurant, kept everything moving efficiently, joked with every table, and didn't forget a single thing), I settled on the house-made, rustic paté, the fried grouper cheeks, the peppercorn filet with a cognac cream sauce, and the Grand Marnier souffl. FYI, my mouth is watering remembering this meal. The paté is delicious. It's perfectly spiced and the quality of the meat is outstanding. It's one of the things that separates Bistro Paul Bert from other bistros. They actually own farms in Normandy and Brittany where they source most of their ingredients. The tempura fried grouper cheeks are light and crispy. The house made tartar sauce is creamy and compliments the fish perfectly. I adore grouper anyway and this is a new twist for me. If I lived in Paris I would eat this dish as often as I could. Full disclosure, I'm not usually a filet fan. I've always thought it was an overpriced, under flavored, cut of beef. This filet showed me how wrong I was. I wish I could do the Vulcan mind meld trick from Star Trek because it's the only way I could adequately describe my experience. Perfectly cooked, butter soft, exploding with flavor. The peppercorns, cognac, and cream enveloped the filet in a sauce that I can only describe as otherworldly. This is what comes from using an outstanding product, and perfect preparation. What really impressed me was the fact that this dish could have been mediocre. Bistro Paul Bert is FAMOUS for this dish, and they could have half-assed it knowing that they were going to continue to sell portion after portion regardless of the quality. But they didn't. I have no doubt that if I went back 100 times and ordered the filet it would be as amazing every single time. The soufflé was light and eggy, with a perfect balance of sweet (but not too sweet) and boozy (but not too boozy). Heavenly. For those of you thinking, "You had dessert?! ", I reply, "How could I not?!" Yes I was full, yes it was over the top, yes my cardiologist would have slapped me around if he saw me, but come on! There was NO WAY I was going to miss out on the perfect ending to a perfect meal. So I saw amazing art and fed not only my heart and mind, but at Bistro Paul Bert my body and soul as well. Needless to say I slept VERY well after my most Parisian of days. As I've mentioned before, one of the biggest mistakes I think people make when they travel is they fall into the trap of, "I may never get back here so I have to do EVERYTHING!" Their trip becomes one museum/tour/famous landmark after another, and they never really spend any time experiencing the city they're in. People have come to Paris for hundreds of years and never stepped foot inside any famous landmark and had an incredible time. Frankly, if you came to Paris and only did five things -- drink wine, eat baked goods, eat cheese, sit in a cafe, and drink coffee -- that's a successful trip to Paris. I was determined to strike a good balance between "famous sites" and "local experiences" on this trip. 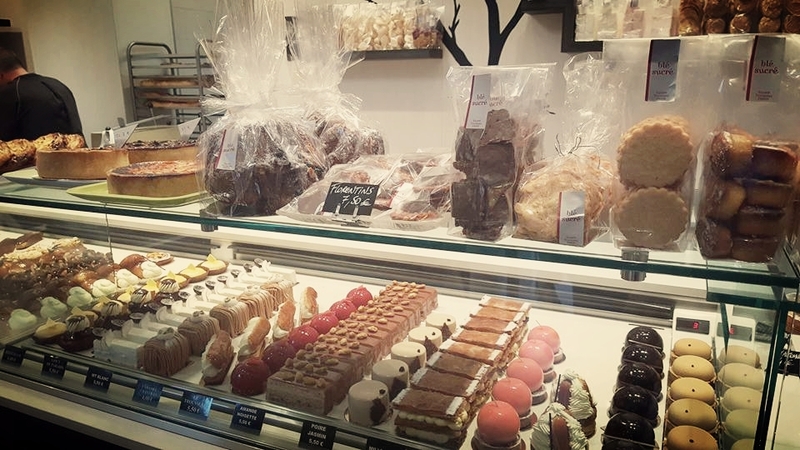 The case of beautiful pastries at Blé Sucré. Photo courtesy of Tal Schultz. Located in the 12th arrondissement -- and just two quick Metro stops away from my flat -- Blé Sucré is one of the neighborhood gems you can find all over Paris. As I enter the smell of baking bread and other goodies hits me. It's remarkable. The cases are full of gorgeous pastries and breads. As much as I'm tempted to buy one of everything and end up in some sort of happy pastry coma, I am on a mission. I need to have a croissant...and maybe something else. I end up with a croissant, a pain au chocolate, and a beautiful mini tarte tatin. Yeah I know. Give me a break, I'm on vacation. Sheer bliss. The croissant is buttery, flaky, and perfectly made. The pain au chocolate is wonderfully decadent -- the quality of the chocolate is off the chain! The tarte tatin is really something. Flaky pastry base topped with a tart apple and drenched in caramel. I am so envious of people who can bake on this level. I thoroughly enjoy my breakfast and decide to put the carbs and caffeine to good use and enjoy the 'Marais Walk" Rick Steves lays out in his Paris travel guide. It starts at the Place de la Bastille -- one block away from Blé Sucré -- and incorporates my next stop, the Musée Picasso. Two miles and two to three hours of walking will do me good. Exhibition Poster for Picasso 1932. Image courtesy of the Picasso Museum. 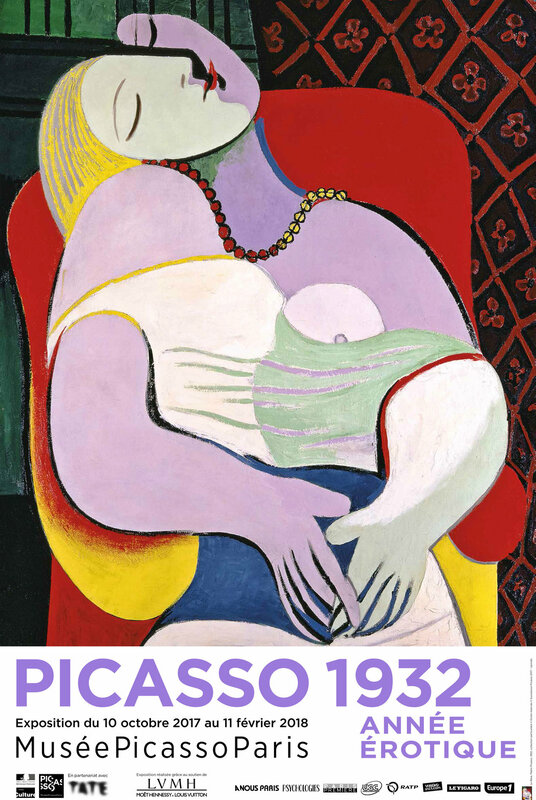 Pablo Picasso (1881-1973) was probably the 20th century's most famous artist. He worked in many styles and across different media. You don't have to study Picasso very long to notice his very unique way of expression. The museum itself is housed in the Hôtel Salé, a home built in the mid-1600's. Picasso was a working artist and owned many of the works he completed. His family also had a lot of his work and under French law, could donate the significant artwork in lieu of paying taxes. Therefore, the museum has over 5,000 pieces of Picasso's work including many on paper, ceramics, wood, and metal in addition to his paintings. 1932 was also the year that Picasso's ongoing affair with muse Marie-Thèrése Walter was near its zenith. He had met her in 1927 coming out of a local department store and supposedly said to her, "You have an interesting face. I would like to create a portrait of you. I feel we are going to do great things together. I am Picasso." Clearly, Picasso had no inferiority complex. Marie-Thèrése would become his muse and lover, give birth to his first daughter, and inspire Picasso to create some of his more famous works. There were also several pictures of Dora Maar highlighted in the museum. Maar was Picasso's lover and muse after Marie-Thèrése. Maar was a surrealist and a well-known photographer. Dark haired and striking, Maar was very different than the blonde, curvy, Walter. Maar would be with Picasso through WWII and also become a major influence on his work during that time. One of the more fascinating things about the museum's collection is how many of Picasso's ordinary, day-to-day things there are. I really enjoyed looking at items like handwritten lists of people he wanted to invite to a Christmas party; ticket stubs from a boxing match; photos of Picasso on holiday; and his horse who he had stuffed (Just kidding. That was Napoleon). What you realize is that, while he may have been an artistic genius, he was in many ways a regular guy. I thoroughly enjoyed the Picasso Museum. It's definitely a place I can see myself returning to on future Paris visits. Crepes are iconic in France. The word crepe is French for pancake and they originated in the Brittany region in the northwestern part of the country where they were traditionally made from buckwheat flour. There are dozens of crêperies throughout the city, but one name kept popping up when I looked into going somewhere -- Breizh Café. Conveniently located very close to the Picasso Museum, Breizh Café was the perfect place to have lunch. 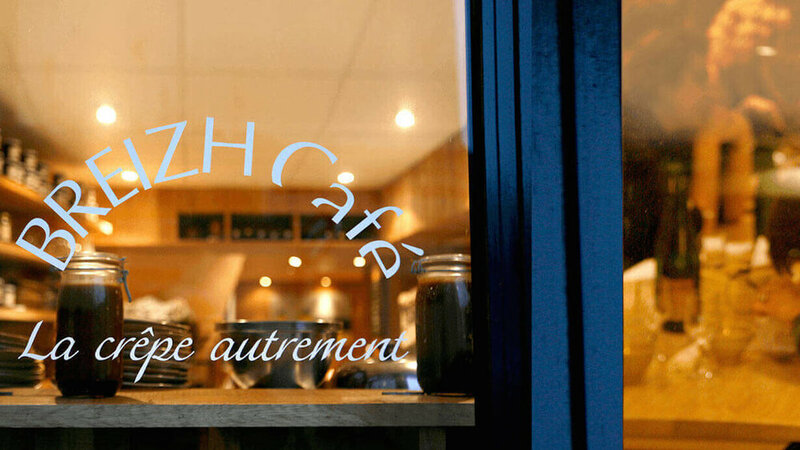 Breizh Café, much like most of the restaurants I encounter on my trip, is small. They get the most out of their space by the use of banquettes. I'm shown to my table and check out the menu and the chalkboard for the daily specials. After the sugar rush I got from Blé Sucre earlier I'm going with a savory crepe for lunch. The staff at Breizh Café are friendly and helpful. After inquiring about several different choices I ask my server what he'd recommend. His recommendation is local ham, comté cheese, and a sunny side up egg, all wrapped in a buckwheat crepe and served with the amazing Breton Butter. I'm sold. I order the cheese platter as well because...France...cheese. Breizh Café is also known for their hard apple cider. Of course I have to order this to see how our Western North Carolina Ciders stack up. Buckwheat Crepé with ham, cheese, and egg. The crepe is outstanding. The buckwheat flour gives it a much nuttier and heartier taste than a white flour crepe. The ham, cheese, egg, and butter are perfect additions. The freshness of all the ingredients sends the flavor level to 11. I am very impressed with the cider. Not too sweet, not too dry. I love how it's presented in a ceramic pitcher and poured into an actual bowl. You really feel like your eating and drinking the way folks have done it in Brittany for hundreds of years. I've got to say that as fantastic as the cider is, some of the cider I've had in WNC is just as fantastic. I felt completely at home at Breizh Café. The clientele is a great mix of younger folks, many with kids in tow, older folks, people discussing business, and tourists. Again, this has the feel of a real local joint. Certainly worth a return visit. Au Passage Restaurant -- Paris. There has been a movement going on in France for several years now. The "Old" way of cooking and dining is not necessarily considered the "Best" way of doing things by the latest generation of younger chefs. The idea that someone would have to dress up, pay a sizeable amount of money, and spend hours eating a meal, doesn't translate as well for todays younger diners. Led by chefs like Gregory Marchand at Frenchie, Inaki Aizpitarte at Le Chateaubriand, and Yves Camdeborde at Le comptoir, the idea of this "Bistronomy" movement is to give people dishes made from high quality, local ingredients, at a much more affordable price. Opened in 2011, Au Passage is a restaurant also on the cutting edge of this new wave of dining. The small-plate, tapas style of service fits beautifully into the idea of giving customers high quality ingredients, prepared with the highest skill, at a reasonable price. Au Passage is on its third chef since 2011. The M.O. has been for the chef to be there for a few years and then go out on their own. The current occupant of the kitchen is an American! Dave Harrison grew up in the Dallas Metroplex, but spent time honing his culinary skills in Austin. I got to chat with him briefly after service and he is loving the opportunity to cook food his way. It's a great attitude to have. He's young enough to have the energy to cook amazing food from a menu that literally changes every day. There are days when the lunch and dinner menus change based on what is fresh and available. I arrive and am given a seat at the bar. The atmosphere is busy, with a punk vibe. The patrons are boisterous and the music matches their volume. The menu is very interesting. Because they need to keep their per plate cost lower, Chef Harrison and his fellow kitchen staff use every bit of an animal they get. I decide to try pig ear salad, tripes with XO sauce and black radish, and sautéed duck hearts with roasted brussels sprouts. Each dish was exquisitely prepared. The tripe dish is one of the better things I've eaten in quite awhile. The richness of it was unexpected and the XO sauce was a perfect compliment to the tripes themselves. Au Passage has also embraced the Natural Wine Movement. I'll write more about this in a later post but for now just know that "natural" wines are younger, organic, more aggressive, and from wineries who have decided to make their way outside the traditional system. Much like the new wave of restaurants such as Au Passage. I have three different wines to go with the three plates. I rely on the server/bartender to guide me and he doesn't steer me wrong. An acidic white to start that works with the fatty pig ear and tangy mustard. Then two reds, one lighter and one more robust, to go with the tripes and duck hearts. Again, the wines pair really well with the food and bring everything together. Chocolate Ganache with Olive Oil and Gray Sea Salt. Dessert was a decadent chocolate ganache with olive oil and gray sea salt. It was slight overkill after the richness of the meal itself, but it was well worth it. Au Passage is a fantastic little place with a great vibe and show-stopping food. The fact that it was literally 50 feet from the front door of the building my flat was in was a bonus. Definitely worth a return the next time I'm in town. So another eventful day in the books. I enjoyed some world class food, saw famous artwork, and I still have so much more left to do! Next: The Louvre, the Musée d'Orsay, and the Classic Bistro Experience. L'Arpege's Iconic Hot Cold Egg. House made bread. Musée de l'Armée, The Sculptor, and the Best Lunch of My Life. Napoleon's Tomb - Musée de l'Armée. The Army Museum contains military weapons, uniforms, and artifacts highlighting French military conflicts. As a history major and a student of European history I was excited about seeing this impressive venue. It has six major areas. I concentrated on a couple of them. The Contemporary Department that concentrates on the period between 1871-1945 and the Dome des Invalides -- where Napoleon's Tomb is located. It's possible to spend several hours here to get a full picture. In all honesty looking at a lot of different cannons and medieval armor really isn't my thing. I did find the displays of uniforms and artifacts, not just from France, but from allies and foes alike, fascinating. The Dome des Invalides is beautiful. It houses the Dome Church and the tombs of Napoleon I, French War Hero Ferdinand Foch -- Supreme Allied Commander in WWI, as well as dozens of other French War Heroes. It is modeled after St. Peter's Basilica in Rome. I thoroughly enjoyed the few hours I spent at the Army Museum. The displays and movies -- especially the section on the holocaust and the death camps -- are very moving. In a career that spanned the late nineteenth and early twentieth centuries, Auguste Rodin (French, 1840–1917) was deeply inspired by tradition yet rebelled against its idealized forms, introducing innovative practices that paved the way for modern sculpture. He believed that art should be true to nature, a philosophy that shaped his attitudes to models and materials. To say I am an art expert is laughable. To say I am an art aficionado is stretching things. The best way to describe my relationship with art is, "I know what I like". I like the work of Auguste Rodin. I like Rodin because he redefined what "sculpture" meant. His works were mocked and ridiculed by the experts and yet, when we look back today we realize his ideas about the human form were revolutionary. Many of the works he did were left unfinished by design. He came from a working-class background and you can see see the reverence he has for people striving in an everyday world. L'Homme au Nez Cassé (1865). Rodin Museum. L'Homme au Nez Cassé (1865). Rodin Museum. Shown from Behind to Highlight the Missing Portion. The museum itself is housed in his former residence. You could spend hours here looking at the various sculptures, sketches, paintings, and models. I enjoyed wandering through the main house and the gardens. One of the things I love most about travel is being able to put into perspective things you've seen pictures of or heard about your entire life. The "Thinker" -- Rodin Museum. Most people will immediately say "The Thinker" when asked about their knowledge of Rodin. I admit to doing the same. There is no doubt that Rodin's work "Le Penseur" is universally known. Yes, the figure in the statue is contemplating, but the figure is muscular and rough, not the type generally thought to be a "thinker". It's again the genius of Rodin making the viewer themself re-think their idea of intelligence. I was also captured by the painstaking detail and passion in his work "The Burghers of Calais". Commissioned by the city of Calais in 1884 to commemorate an occurrence during the Hundred Years War between France and England (use the Google machine to look it up if you're interested.) Again what is so striking is that these subjects are not canonized -- although they were heroic -- they are shown with all their flaws. They are literally sculpted larger than life, but they are so...human. I was surprised at how much this piece moved me. The Gates of Hell. Rodin Museum. "The Gates of Hell" is another of Rodin's huge masterpieces displayed in the museum's gardens. Commissioned in 1880, Rodin worked on this piece until his death in 1917. Depicting a scene from Dante's Inferno, you can see Dante perched atop the gates looking over his characters. The piece depicts figures from the classic work. Again, the detail is amazing. Walking up to it you get a sense of the time and effort Rodin put into this. I could have spent the better part of an hour just looking at the individual figures in their varying degrees of pain and suffering. I wasn't able to get to the Rodin Museum in 2006 but I am so glad I made time on this trip. His work is so inspiring and so modern, but with a foot firmly placed in the classical style. Definitely a highlight. They say you never forget your first time. In this instance, Chef Alain Passard's iconic restaurant L'Arpege is my first. My first three-starred Michelin restaurant. Michelin determines that a restaurant is worthy of their coveted trois étoiles if it has, "exceptional cuisine that is worth a special journey". I assume flying over an ocean qualifies as a special journey. As soon as I booked my trip I knew I would be dining at L'Arpege. I had seen Chef Alain Passard, his restaurant, and his farms on an episode of Chef's Table:France and I was stunned. Here was a Chef who had achieved the ultimate, three Michelin stars, serving primarily roasted meats. Then all at once he took meat completely off the menu and served nothing but vegetables. The press, critics, and many of his long-time customers were aghast. Surely there would be no way he would keep his stars serving vegetables! Keep them he did, and now, with seafood and some poultry back on the menu, he is enjoying his 22nd consecutive year of the honor. Chef Passard grows all the vegetables for L'Arpege at one of three farms he maintains outside Paris. Each farm has a unique terroir, so the same vegetable grown at the three locations will have a different taste and character. I knew I was going to eat in some wonderful places on my trip to Paris, but something about the story, and the way the food looked, and Chef Passard himself, made this my destination meal. I would not be disappointed. I had done my homework on L'Arpege before I arrived in Paris. I had spoken with my friends Lisa and Matthias who have been several times and got some dishes to ask for. I was prepared. Or so I thought. I've been to a two-star Michelin restaurant -- The Clove Club in London. It was fantastic. The food was amazing and the service was as well. I wondered what would be different at L'Arpege to elevate it to the tree-star level. I didn't wonder for long. As soon as you enter everything starts. I went to the host stand and gave my name and at that moment it was like no one else existed for the staff -- even though the restaurant was full and bustling. I was shown to my table, given my menu, and asked my preference for water and any pre-lunch apéritif I might like. I had already decided on the Gardener's Lunch tasting menu and I knew there would be several glasses of wine involved so I declined the apéritif. My thoughts on wine are the same as my thoughts on art. I know what I like. However, I had decided to just go with the suggestions from the sommelier. I was doing wine by the glass so I could try several things. Because the menu is mainly vegetables I expected more whites, but I ended up with a lovely combination of reds and whites. Again, I was doing the Gardener's Lunch tasting menu. The menu itself simply said, "This morning, the gardens have blessed us with a pallet of flavors...let yourself be guided by the Chef's improvisation and experience a sensory stroll." I was putting myself in the hands of Chef Passard and his culinary team. I did have a couple of specific dishes based on the recommendations of friends. I knew I wanted Ravioles des Legumes, Onion Gratin, and, because they are in season, scallops. The first two dishes come one right after another. The first is an amuse bouche of small tarts filled with beet, carrot, and spinach purees. Each one is a tiny flavor bomb. Every table gets these and I realize that this dish has been made en masse meaning it could have been a complete throwaway but it wasn't. I also realize that if this is how the meal is starting, I'm in for something special. I need to mention that there is a real intimidation factor for me here. I don't want to do something wrong or say something wrong or heaven forbid, use the wrong utensil. This quickly dissipates as the dining room staff is completely warm and welcoming. They move around the dining room effortlessly. No one has an "assigned" table. Every table is a guest of the house and are treated accordingly. Next dish is the famous Hot-Cold Egg. A coddled egg with sherry vinegar, spices and maple syrup. I have no idea why this works, it just does. The depth of flavor, the contrast of temperatures, the sweet versus acidic notes from the maple syrup and vinegar. It's wonderful. I sit back and contemplate the thought process behind this dish. It's not the last time I'll be contemplative about this meal. When Chef Passard envisioned his all vegetable menu, I have to believe this next dish is what was in his mind. Ravioles de Legumes is a simple dish of three ravioli, each filled with a different vegetable, in a broth. My ravioli were filled with spinach, beet, and winter squash. Each one was so flavorful, so individualistic. Each vegetable was allowed to shine. The broth on the day I was there was celery based. I wasn't sure what to expect. The danger of cooking with celery is that it's such a strong flavor it can overwhelm everything else in a dish. The depth of flavor in the broth was earth-shattering. I simply could not believe how good this was. On its own the broth would have been one of the best things I had in Paris. When I took a bite of ravioli and broth together it was insane. Everything worked together perfectly. Truly remarkable. This is what I was hoping for when I booked my table. The next course was the onion gratin. Onions and parmesan cheese perfectly cooked under the broiler. I'm not sure if this is how it was supposed to be eaten but I slathered it on the dark, house made bread. it was heaven. I'm figuring out why L'Arpege has had three Michelin stars for so long. Everything they do is purposeful. Every dish has been thought through and the ingredients are so good that something as simple as an onion gratin gets elevated to something truly special. It's not that this dish couldn't be done really well at another restaurant. It's that this dish, with these ingredients, is as important to Chef Passard and his kitchen staff as anything on the menu. It separates good from great and great from exceptional. The courses kept coming, perfectly timed. There was a gorgeous vegetable sushi -- sushi rice with vinegar, mustard, and a slice of beetroot. A pumpkin soup with a savory whipped cream served tableside. A scallop mousse in a seafood foam that blew me away. There was dish of grilled lettuce, beet puree, and green onions in a savory sauce; and beet tartare -- topped with an "egg" of creme fraiche with a gelee "yolk", beetroot leaves, butter lettuce, and parsnip chips that was whimsical and delicious. Chef Passard is known for roasting poultry and the bird served the day I was there was capon. I was given the breast with roasted carrots and beets, and whipped potato. Then a dish of Dover sole that made me rethink how fish could be prepared and taste. After that sweet, whole scallops in a velouté and topped with purple radish that nearly brought me to tears. I had been dining for nearly three hours by this point. During that time I had seen Chef Passard coming through the dining room, greeting guests -- some very casually, some more formally, but he made a point to spend time with each table. I could tell there were tables with people he knew very well. He would sit down and have an intimate conversation. Or lean in and share a joke. He was always moving, but never seemed in a rush. Then he would disappear back into the kitchen. Me and My New BFF Chef Alain Passard. Later when I looked at the picture (and saw I should have taken my damn glasses off) I realized that he was being slightly cheeky. It made me like him even more. I had placed my order for the dessert soufflé earlier in the meal and was very excited to try it. Of course this being L'Arpege, there couldn't just be ONE dessert. First there was a dessert board with small elephant ears, tuilles, house made caramels, and a chocolate/hazelnut bar. I tried every one and they were all amazing. Next came a mocha flavored floating island in a milk caramel sauce that would have been a perfect ending to any meal served anywhere. The soufflé came and it was as good as I'd hoped. Light and delicious. This WAS the perfect end to my meal. I think. To be honest I was in in the throes of a food coma at this point. I know it was delicious. At last it was time for the meal to end. 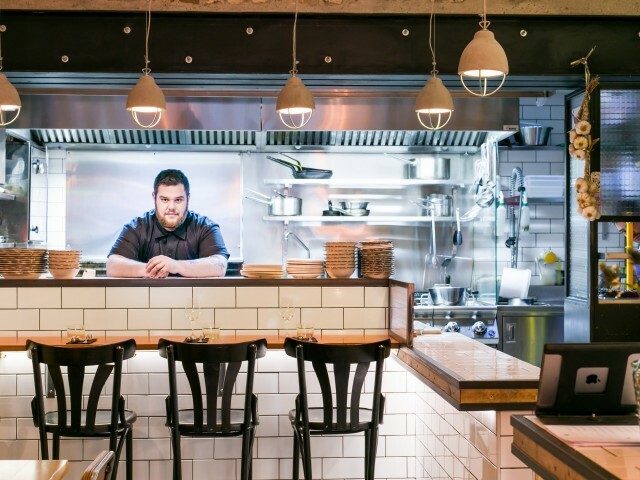 As I was leaving Chef Passard, who was sitting at another table, got up and came over to me. He gave me a huge hug and said, "Thank you so much for coming today. I hope you come back and see me again!" It was very special. I was having a difficult time processing what I had experienced. It would be several hours before I could. I ended up cancelling my dinner at another highly rated restaurant. Mainly because I was ridiculously full, but also because it would have been hard to enjoy after such an experience. All in all, my first full day in Paris was a complete triumph. I had a day that completely overloaded my senses. I had my first three-star Michelin experience (hopefully not my last), saw world famous art, and got the answer to the question, "Who is buried in Napoleon's tomb?" My trip was off to a screaming hot start. I couldn't wait to see what came next. Wall Mural Outside Le Centre Pompidou, Le Marais. The Neighborhood, THAT Sandwich, and All the Truffles. While seeing all the major sites in a city like Paris is admirable goal, you can get so caught up in things you "have to do" that you forget to stop, look around, and realize that you are in one of the great cities of the world. That city is home to over two million people who call Paris their home (I'm jealous of every single one of them by the way). Those people live in neighborhoods throughout the city called "arrondissements". There are 20 arrondissements in the city, starting with the 1st -- where the Louvre is -- and spiraling around like a snail shell out to the 20th. Le Marais spreads over parts of the 3rd and 4th arrondissements on the right bank of the Seine River. Locals hang out in the Marais. It's home to the Jewish quarter, the Place des Vosges, the Picasso Museum, and the National Archives. It's where Jim Morrison lived and ultimately died. I fell in love with Le Marais when I was in Paris twelve years ago and my love has only grown stronger since. Le Marais, THAT sandwich, and all the truffles. I arrived in Paris, got settled in to my temporary home, and set out to immerse myself in Le Marais. What I love about Le Marais, and ultimately Paris, is that you can walk pretty much everywhere. The streets in many areas meander, and because space is at such a premium you never know when or where you'll find a cool shop, a quaint cafe, a green space that's perfect for a break, a bit of architecture that blows you away, or a restaurant that everyone says you have to try. Miznon -- 22 Rue Ecouffes. Le Marais. I was on a particular mission my first afternoon in Paris. I was going to grab lunch at Miznon. Friends who have eaten there raved about the place. It's Israeli food with a French attitude. The first thing I notice when I walk up is the line. It stretches halfway down the block. People are standing in a cold mist, talking to the folks next them, looking at their phones. No one seems to mind. I get in line and nod hello to the lady next to me. She greets me with a friendly "Bon jour!" I reply the same way and ask if she speaks English. She does and I ask if she's been here before. "Oh yes. At least once a week, sometimes more. Everything is good. Make sure you try the vegetables." I know I've chosen wisely. I make my way inside. It's much steamier than outside. The space itself is small. Counter with a dozen seats and the prep and cooking areas behind it. A couple of small tables, one large communal table. What I also notice is the music. A steady stream of old school, west coast hip hop is thumping through the speakers. The place is full of families and as far as I can tell no one has a problem with the music or the language. I fall a little more in love with both Miznon and Paris. I slowly but surely make my way to the counter to order. The menu is in French but between my pidgin French and the helpful dude behind the counter I order the sausage sandwich and the roasted head of cauliflower. The sandwich is amazing. It's smoky and succulent. The hummus is creamy and a perfect compliment. The bread is spectacular. It's unlike any pita I've ever had. It's light and fluffy and much more flavorful than what I've experienced before. I ask if they make it themselves and I'm told that it's flown in from Israel par baked and they finish it in the store. It's remarkable. The cauliflower is something else entirely. An entire head of cauliflower roasted with only olive oil and salt. The vegetables in Europe taste better than vegetables here. Anthony Bourdain says it's all the dead Romans in the soil. I can't prove him wrong. With only salt, olive oil, and heat it's sweet and savory and all together wonderful. Yes, I ate the entire head of cauliflower. It was all I could do not to order another one. Miznon was a perfect start to my Paris culinary adventure. They just opened a store in New York at the Chelsea Market. I'm planning a trip because of it. I'm totally serious. Frenchie Wine Bar -- 6 Rue du Nil, Paris. One of the downsides of the new wave of high quality, more sensibly priced restaurants is that it can be difficult getting a table -- even for one person. I tried unsuccessfully to score a reservation at hot spot Frenchie but it was a no go. One of the cool things about this new wave of restaurants is their lack of pretension. Because these smaller places have a lower overhead, several of them have opened a satellite place very close by. To that end, across the narrow street/alley from Frenchie is Frenchie Wine Bar. Here you can get a scaled down version of the menu at the main restaurant, and you don't need a reservation. I showed up at the appropriate time and scored a table right away. Luckily for me it was right next to the kitchen and I could watch the three-man team work their magic. I love experiences like this. The Kitchen at Frenchie Wine Bar. It's tiny! The menu might have been a scaled down version of the main restaurant but it was by no means uninspired. Chef Greg Marchand and his culinary team put together a menu that would impress anywhere. I chose to go with the Roasted Brussels sprouts and parmesan aioli as a first course. I have learned to love Brussels sprouts, especially roasted. The roasting process sweetens them and takes a lot of the funkiness out of them. These were then covered, and I mean COVERED, with a thick layer of parmesan cheese. The salty cheese was the perfect counterpoint to the sweet, slightly charred sprouts. Simple and delicious. The reason seasonal, farm-to-table cooking is so popular is because people appreciate eating dishes made with ingredients that are at the peak of their flavor. Summer gives you beautiful tomatoes, spring vegetables are always tender and sweet. January is black truffle season. This is a good thing. There are two dishes on the menu that feature black truffles. Violet artichokes, gnocchi, lardo, and black truffles and fresh tagliatelle with black truffles. I order them both because when am I going to get the opportunity to eat truffles like this again any time soon? The dish of tender artichokes, pillowy gnocchi, accentuated with the earthy black truffles was inspired. It just worked on every level. The tagliatelle with truffles was just over the top decadence. I'm glad this was a small plate because a full plate would have been entirely too much for one person. The homemade pasta was perfectly chewy, the sauce was creamy and rich, and it was covered in black truffles. It was one of the most intense, delicious plates of pasta I've had in years, probably ever. With a fabulous wine list, wonderful food, and service that is completely attentive but not overbearing, Frenchie Wine Bar is a place where I felt completely at home. It was a great reminder that sometimes the alternate plan is not a negative thing. My first day in Paris saw me reacquaint myself with the Marais and have two completely different but equally delicious meals. Not bad for a start. Next: The Army Museum, the Sculptor, and the Best Lunch of My Life. Ah Paris. One of the Crown Jewels of Europe. My family has a special relationship with this city. In 1944 my Grandfather, Charles Colbert, helped liberate Paris and then marched down the famous Champs-Élysées and under the famous Arc de Triomphe. Eventually he made it home, my dad was born. Fast forward 74 years and in 2018 I made my second trip to this beautiful city. A lot had changed in the 12 years since my last visit, but the spirit, the beauty, the elan is still as strong as ever. It's one of my favorite cities on the planet. During my stay I saw some amazing things, met some fantastic, interesting, people, and ate some of the best food I've ever had in my life. I like to use the internet and folks who are knowledgeable to guide me in planning my trips. This time around I used two folks nearly exclusively. Rick Steves is someone I've known about for years. His guidebooks and television shows are great sources of material. He actually stays in the places he puts in his books, has been traveling for years and has built relationships with folks all over the world, and is a conscientious traveler. I use his books to educate myself about a place and his audio guides and walking tours are fantastic. You can find all of his information and order books at www.ricksteves.com. The second person I relied on for all things Paris is Wendy Lyn. She is a native of New Orleans who has lived in Paris for 30 years. We have a mutual friend who turned me on to Wendy's website "Paris is My Kitchen". Again, she has made amazing connections throughout the city and provides information on places to eat, drink, stay, and shop. Her focus is mainly on the 11th arrondissement (district) but she's a great resource regardless of where you go in the city. Her website is www.wendy-lyn.com. When I was in Paris in 2006 I stayed in an area called "The Marais". It's a real neighborhood. It's fun and funky. Close enough to all the major sites, but it's not going to break the bank to stay there. I saw no reason to stay anywhere else this time but I did have an option unavailable to me in 2006. VRBO. This time, I looked for a private residence rather than opt for a small hotel room. It was the right decision. I found a small studio apartment, one block from the metro, for less than 80 euros a night! I would have a place to base myself out of with a kitchen, wifi, secure entrance, and huge bed and tv. Of course I read reviews and emailed with the owner before I booked, but it was the perfect place for me. I had seven days in Paris. I had things I wanted to do, meals I wanted to eat, and places I wanted to see. I also made sure to set aside a lot of time with nothing planned. Paris is a walking city, and sometimes the best thing to do is to find an area you want to explore and do just that. Look at the architecture, check out the prices of flats (spoiler alert: they're expensive! ), sit in a cafe and leisurely enjoy a cup of coffee while you people watch. The great thing about cities like Paris, London, New York, is that they're set up to give you as much as you want. Sure I was going to do several of the "musts", but I also wanted to see Paris like a local does. It was the right decision. This trip was life-changing. Paris is a destination city for food lovers. The cool thing is that, while you can still find the old-school places that do things the way they've been doing them for decades, there is a new wave of young, extremely talented chefs opening places that focus on whatever is fresh daily. Catering their menus -- many of which are printed at lunch AND dinner to reflect the freshest ingredients -- to a younger, hipper, and more diverse clientele. I am an unabashed foodie. Life is too short to eat crappy, processed, industrial food. I am also a huge fan of shows like "Chef's Table", "Parts Unknown", and "No Reservations". I had researched several places I wanted to go. Most of them were small, local, and reasonably priced for a major city. I was going to eat where the locals eat when they go out for an evening. I did have one meal planned that I knew was going to cost me and I knew I didn't care. I made reservations at the Michelin three-starred L'Arpege. I have admired Chef Alain Passard for years. His menu is mostly vegetable based -- the vegetables grown at his three farms outside Paris. He has held his three stars for 20 years and is a legend in the culinary world. To say I was excited is a gross understatement. So with my itinerary flexible but set, my bags packed, and my phone loaded with apps to help me get around town and communicate with Parisians, I boarded the plane that would take me across an ocean and deposit me in the City of Lights. COMING NEXT: The Neighborhood, the Sculptor, and the Greatest Lunch of My Life.